We are still enjoying gorgeous weather here in Gibraltar....how is yours where you live ??? Oh sooooo cute and great for Christine's theme for our CCC production. I love that you used pink... it's definitely my fave colour this Christmas. Gorgeous card Sylvie, I love the sweet image, pretty colours and beautiful snowflakes. Gorgeous card Sylvie, I like the adorable image, the papers and the snowflakes. This is terrific Sylvie - glad you found such a beautiful image for your card. I love LOTV images, they are always so pretty. Great choice of colours as well. this is gorgeous Sylvie. The image is adorable and she looks so pretty in pink. A beautiful card, so pretty in pink! This is ever so pretty and certainly fits the brief! 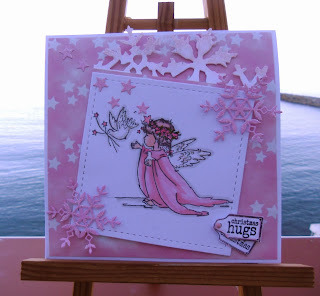 Love the soft, pretty pink colours and the beautiful image and snowflakes! It's WET Sylvie, very wet!!! Love this card, these LOTV images are so cute and it looks so pretty in pink. Gorgeous. Very very pretty - pink for Christmas is just not done enough IMHO!!!! Gorgeous card! Such a sweet image and pretty colours, Sylvie! Live your card! I love that Ohhh! So! Sweet image making a beautiful card. Glad you are enjoying warm weather. Here in the North of Scotland we have "snow" on the higher hills. Does not seem that long since we got rid of last years stuff. Had a scroll back to see the cards I had missed, they are all great, with wonderful designs. Such a cute card! Very CAS and I love the colouring! Thanks for joining our Lili of the Valley 'Pink and White' challenge!